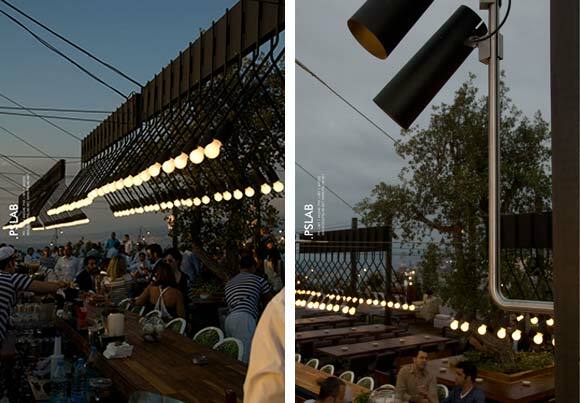 In 2011, legendary open-air Beirut club White has been re-branded and renovated, and the iconic original location reinvented as cocktail bar and restaurant Iris. 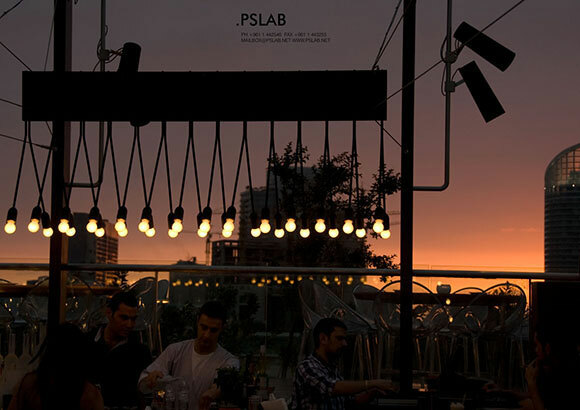 The owners invited .PSLAB to create custom lighting products for the famous rooftop in central Beirut. 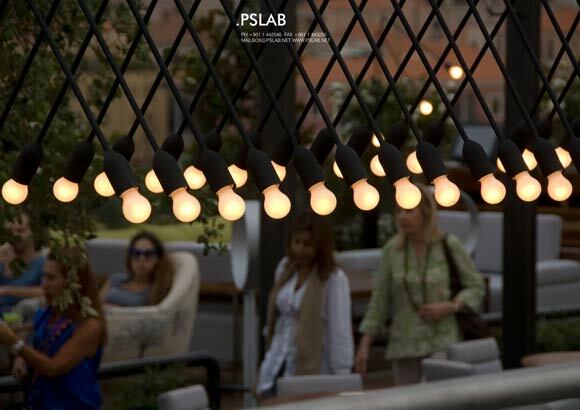 In few months, .PSLAB’s product design team created a strong set of interventions that have given the space a distinctive new mood. The open air rooftop bar is unusually narrow and linear, requiring a strong response to break up the space and respond to the outside environment. The line of the first area with its major central bar element enhances this linearity, and the perspective is very specific. On either side of the bar, depth is provided by the second table third seating areas with their stepped levels. From the entrance, any lighting solution will be partly concealed as the space recedes away from the viewer, but a strong insertion into the space will also define the mood as people enter the bar. A major insertion into the first area was made in the form of two lines of black steel pillars on either side of the bar, which gave a new dynamism to the linearity of the space and concentrated attention over the bar. A further key definition was provided by a line of upside-down V-shaped black steel fixtures finished with white bulbs, suspended over the bar by black cables. The point of the ‘V’ was further defined by the addition of a box to enhance the linear aspect created by lining up a quantity of these products. In the second (table) area, the pillars also defined the space and its different levels. Projectors were fixed to the pillars to cast a softer light in these areas. The projector directions were defined by the columns, being fixed on one side so that they were hidden from the approaching viewer. Dynamism and rhythm was given as the viewer discovers the projectors slowly as he walks further into the space. In the third (seating) area, the products rose up from the floor in clusters of three on long black stems, providing intimate downlighting. These rigid, assertive insertions are nevertheless sensitive responses to the realities of the space. The columns give an overall smoothness to the rooftop’s layout, and a sense of balance. The elegant lines of the products above the bar and the visible bulbs on all the products also give a warmer aspect to the lighting. 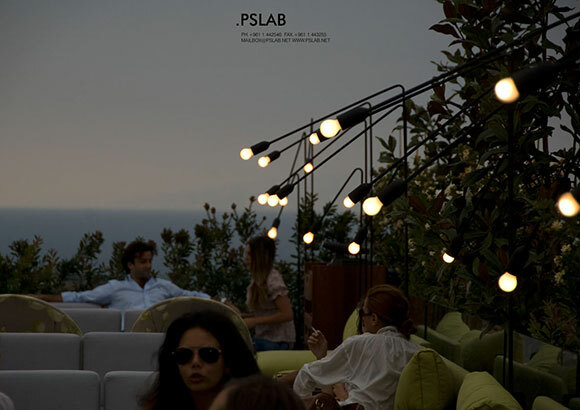 Founded in 2004, and with 100 team members working out of four city bases in Europe and the Middle East including offices in Beirut and Stuttgart, .PSLAB are designers and manufacturers of site-specific lighting products. Our work can be found in private homes in London, conceptual boutiques in Antwerp, restaurants in Paris, offices in Bochum and art galleries in Beirut – and in gardens, events and public spaces worldwide. We have also been internationally awarded for many of our lighting products. Our creative and technical teams work together on every aspect of product development, from concept to construction. This gives us the edge that is the core of our identity – our pieces are individual to particular spaces, and are manufactured by us, in our private factory. 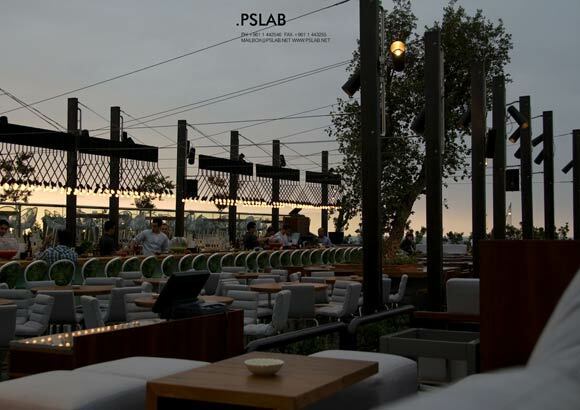 In June 2006 Lebanese FNB concept management company Add Mind opened a new open-air club on the rooftop of the Downtown tower block that houses An Nahar, one of Beirut’s biggest daily newspapers. The club, White, was one of the first post-Civil War venues to showcase a high-end mixture of fashionable entertainment and modern club music, quickly becoming a by-word for Beirut’s resurgent glamorous nightlife. 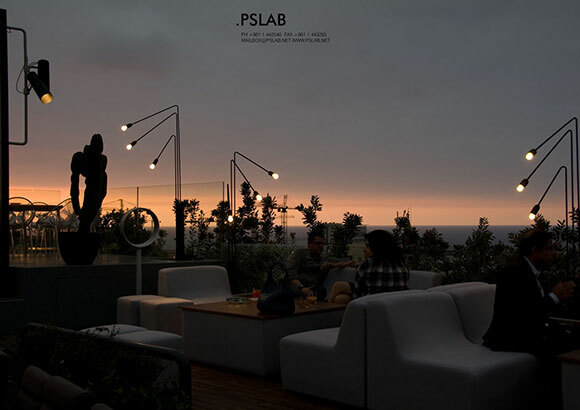 In 2011, the club has moved locations, and .PSLAB was invited to create custom lighting products for the reinvention of the space as a more downbeat lounge bar and restaurant.